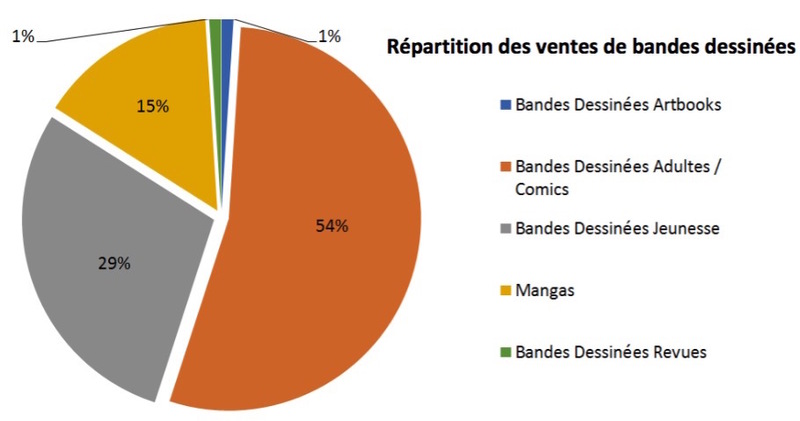 Adult graphic novels, youth comics, comics for kids, manga… It seems the French couldn’t get enough of the stuff in 2018, doubling sales from independent bookstores. By comparison the other sectors rose just 0.6%. The numbers come from a report by the L’Observatoire de la Librairie commissioned to mark the launch of the Festival International de la Bande Dessinée in Angoulême next week. The Angoulême International Comic Book Festival is one of the largest comic cons in the world. The festival kicks off 24 January for four days through until 27 January. 56% of comic books sold were frontlist titles, while 11% were 1-2 years old and 32.7% deep backlist. As the chart shows, adult graphic novels and comics led the market. Via Actualitté, where you can find details of the top-selling titles.